Your house suffered severe damages because you were away from home for a while and an air conditioning pipe broke drifting water everywhere. Since then you have been living in an uncomfortable situation and searching the internet you found our previous blog posts, where we answer your question whether your homeowner insurance does cover water damage and what types of coverages are available for that kind of accidents. Ok, but now you want to present a claim, and that’s why you came here. Just one more minute! Before jumping right into placing a claim, it’s useful to understand the claim process and what your options are. When you place a water damage claim with your insurer, the insurer will send a claims adjuster to assess the damage and prepare an estimate for the insurer. This inspection is called “field scoping”, and is used to determine the extent of the damage and what needs to be replaced or repaired. The adjuster might also recommend additional remediation such as fans for structural drying or tarps for temporary cover. There are actually three types of insurance adjusters, with a large part of the difference between the different types being whose interest they represent. Due to this difference in who is represented, homeowners often find significant variances in repair estimates — and in outcomes — depending on the type of adjusters involved in the claim. Insurance Company Adjuster: The insurance company adjuster works for the insurer, is paid a salary by the insurer and represents the insurer as opposed to the homeowner. This doesn’t necessarily mean you will be treated unfairly in the claim, but it’s useful to understand who the insurance adjuster represents — and it isn’t you. Independent Insurance Adjuster: The term “independent” can be confusing in this case. An Independent adjuster is hired by the insurer to perform claim damage inspections on behalf of the insurer. While an independent adjuster isn’t an employee of the insurer, the independent adjuster is a temporary representative of the insurer and some independent adjusters may do a significant percentage of their work for one or two insurers. Often independent adjusters are used when claim volume is high or when the insurer doesn’t have a company adjuster in the area. Public Adjuster: A public adjuster represents the homeowner — as opposed to the insurer — and advocates to have the claim handled in a complete manner. Public adjusters can interpret your policy coverage and some even provide impartial policy reviews. The role of the insurance company adjuster or an independent adjuster hired by the insurer is pretty straightforward. In both cases, they represent the insurer’s interests. A public adjuster, representing the homeowner, becomes the homeowner’s advocate and the contact point with the insurer. Public adjusters are licensed by their respective Departments of Insurance in 44 states and are highly regulated in remaining 6 states. 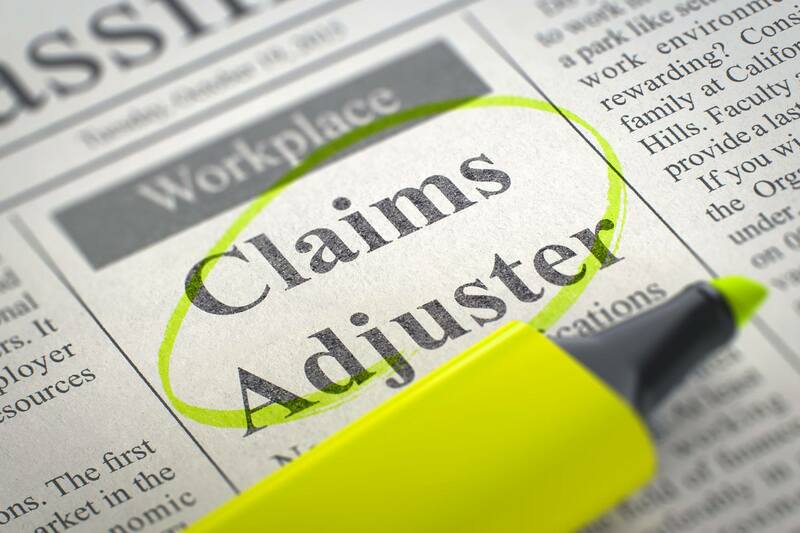 Where an insurance adjuster employed by the insurer or temporarily hired by the insurer can facilitate a claim settlement, claims handled through public adjusters typically have higher claim payouts. A study that tracked Florida claim settlements in 2005 found that homeowners insurance claims handled by public adjusters resulted in settlements averaging over $15,000 higher than when a public adjuster wasn’t used. It’s not magic — and a public adjuster can’t create coverage where there isn’t any — but the resources and knowledge a public adjuster brings to the claim give the homeowner powerful tools to properly settle the claim. The public adjuster negotiates the claim settlement on your behalf. Public adjusters develop a claim assessment using specialized software as well as consultation with building engineers, expert contractors, and remediation and reconstruction companies. Typically, a public adjuster can provide a much more in-depth damage assessment than an insurance adjuster employed by the insurer or an independent adjuster contracted by the insurer to handle the claim quickly. Can I Reopen an Old Water Damage Claim? If you’ve had a water damage claim within the past few years and you think the damage was more extensive than the settlement offered by your insurer, many times the claim can be reopened. This is another situation where using a public adjuster can be beneficial. An insurer won’t give you more money for an older claim just because you asked nicely. You’ll need documentation to make your case, and the resources available through a public adjuster — including access to experts — can help prove that the water damage to your home is more extensive than first assessed. Sometimes water damage is unpreventable but there are a few simple precautions you can take to help prevent some types of water damage. Ensure Good Drainage: Standing water or pooling water around your home are almost never a good thing and being sure that water can drain away from your home is an important first step to keeping the water outside where it belongs. Test Your Pump Regularly: If you have a sump pump, be sure to check it frequently to be sure your pump is working properly. Most home insurance policies don’t cover sump pump overflow or failure — unless you buy a special rider. Consistently Check For Water Leaks: No type of water damage is fun, but the gradual water leaks are the ones that create problems with insurance coverage. A small leak left unrepaired can create just as much damage as a larger leak or spill — but the gradual damage likely won’t be covered. It’s best to be vigilant and fix leaks as soon as you find one. Stop the flow of water: Turn off the water valve if the water is coming from inside your home. If the water is coming from the roof, try to get the roof covered — but keeping safety first. Turn off the power: Water and electricity can be a dangerous mix and can cause further damage to your home. Rescue your most valuable possessions: Photos and other items can be priceless. Get any valuables out of harm’s way first. Get rid of standing water: Standing water is never really just standing. It’s seeping into everything it touches and causing more damage. You’ll want to get rid of standing water as quickly as possible. Allow appliances to air dry: You may be tempted to turn on an appliance you suspect got wet just to see if it still works. Powering on appliances or electronics can be extremely dangerous and might create a short that damages the item. It’s better not to test appliances or electronics until you’re absolutely certain they have completely dried out. Assess the damage: Minor spills and water leaks can often be cleaned up without placing a claim — but even a minor spill can cause major damage so it’s important to inspect the area affected by water to be sure there is no permanent damage. If the water damage looks more extensive, it may be time to consider a water damage claim. Water damage remains one of the leading causes of home insurance claims and one of the most difficult types of damage to properly assess. The average homeowner doesn’t have the tools needed to determine the full extent of damage and is left to trust the insurer’s assessment. As soon as you hire Stellars Public Adjusters services , you will understand how beneficial it is for you and will get a grasp of all of the time you are saving.